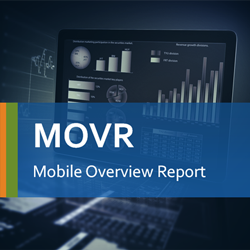 Today, ScientiaMobile has launched its MOVR (the Mobile Overview Report – available here) to provide mobile web developers and other mobile stakeholders with critical statistics about the state of the mobile Web and the mobile device market across the globe. Building on its expertise with WURFL, the industry’s leading device detection solution, ScientiaMobile will publish MOVR and a corresponding open data set on a quarterly basis to outline important trends about mobile device usage and their capabilities. In Western countries, smartphones generate 65% of mobile device Web usage, but tablets have grown to 33% of traffic. Apple has a strong share by of smartphone usage in Western Countries, with 39%. Conversely, in Asia, Android manufacturers like Samsung, and to a lesser extent HTC, LG, Sony and Motorola cumulatively generate 87% of traffic. Apple’s iPhone 5, 5s, 4s, and 4 hold 4 of the top 10 smartphone models among Western Countries. Larger-dimension smartphones like several Samsung Note models are among the most popular in Asia. Feature phones represent a long tail of 2% of the overall Western traffic, with much regional variation by phone model and browser. Apple dominates Western tablet usage with 73% of traffic, driven by multiple iPad models running primarily the iOS 7.1 operating system. Android’s operating system usage is fragmented across five release versions (4.0 – 4.4). Release 4.4 is the most popular at 28%. Apple’s models drive the most popular Western screen resolutions for smartphones (640 x 1136) and tablets (2048 x 1536). Smaller 7 and 8 inch tablets generate substantial browsing traffic, especially in Asia where the 1024 x 600 resolution screen is the second most popular size, generating 27% of Asian tablet traffic. Peak-hour usage for both tablets and smartphones occurs at 9 PM in Western Countries, with a particularly high peak for tablets. This indicates strong leisure usage of mobile devices. “MOVR reflects the growth of ScientiaMobile’s analytics efforts. Not only do we provide customers with great WURFL tools to detect and analyze their own traffic, but we also have a unique ability to analyze massive amounts of mobile device usage data collected within our own house. We feel this information should be shared freely amongst the developer community. This is why we embraced the Open Data spirit and released the data set in our report with a Creative Commons license.” says ScientiaMobile VP of Innovation Jon Arne Sæterås. ScientiaMobile has sampled an ever-growing data set of over 1 billion HTTP requests to extract device information. In the MOVR report, readers will find detailed statistics about smartphone and tablet usage, including: usage by device manufacturer, usage by top devices, usage by operating system versions, and screen resolutions. The first edition of MOVR provides comparisons between Western Countries and Asia. It also drills down on specific countries – in this quarter, the United States and Germany. In future MOVR reports, ScientiaMobile will explore more mobile device trends and highlight different geographic regions. “The statistics in MOVR clearly describe an increasingly complex device landscape. ScientiaMobile provides an array of industry-leading WURFL tools to manage this complexity. Enterprise-grade WURFL products enable developers to implement web optimization, device-aware mobile advertising, and device analytics,” said CEO Krishna Guda. ScientiaMobile provides the industry’s most accurate and flexible device detection solution, helping customers deliver great web experiences and manage the increasingly fragmented mobile device ecosystem. ScientiaMobile sells WURFL, a constantly-updated repository that catalogues thousands of devices and their capabilities and provides access to them via range of API languages. The WURFL framework enables many organizations, including Fortune 500 companies, to effectively design and analyze web experiences for an ever-growing range of smartphones, tablets, smart TVs and game consoles. ScientiaMobile also powers WURFL.io, a collection of free tools designed help front-end web developers easily improve the mobile user experience.